Recently published, that article provides an interesting on Hans Fallada's Berlin, through is now famous novel Alone In Berlin / Everyone Dies Alone. NIEDERKIRCHNERSTRASSE IN BERLIN must be the eeriest street I have ever walked down. Its old and notorious name, Prinz-Albrecht-Strasse, pulses through Hans Fallada’s rediscovered 1947 novel Every Man Dies Alone, for this was the epicenter of the Nazi police state. A complex of offices housed not only the headquarters of the Gestapo and the SD (the Security Service of the SS), but also their umbrella organization, the Reich Security Main Office. For more than a decade, the Gestapo’s basement prison at number 8 sucked in victims, first from Germany and then occupied Europe. A couple of summers ago, a study tour I was leading visited Berlin. Walking down Niederkirchnerstrasse, we saw on our right the low-slung contemporary building that houses the Topography of Terror Documentation Center; most of what remained after allied bombing of the grand structures used by the Nazis, such as the Prinz-Albrecht-Palais, was demolished in the 1950s. The carefully curated architectural fragments — foundations, cellars — on the expansive site only add to the air of sinister absence. Information panels, encased in glass or suspended by wire, seem to hover in front of you, further heightening the ghostly atmosphere. A ground-level sign at the border of a field of gravel tells you that here were the cells of that Gestapo “house prison”: those spaces of suffering have not been dug up. 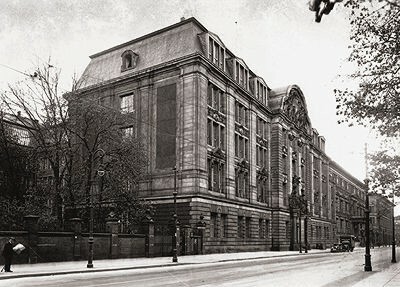 On our left, across from a grimy surviving section of the Berlin Wall, was Göring’s Air Ministry, left staggeringly intact at the end of the war, now significantly refurbished and the headquarters of a much more benign entity: the German Federal Finance Ministry (pace the Greeks). All the same, watching a civil servant heading home on his bicycle, I wondered, What must it be like to go to work every day in a building with that pedigree, a building whose dark windows and heartless facade still suggest the ideology it served? Today the building is called the Detlev-Rohwedder-Haus, in honor of the slain CEO who oversaw the privatization process in East Germany after reunification; Rohwedder’s 1991 murder is still unsolved. Our guide told us that, given the rarity of extant Nazi-era architecture in Berlin, the structure is used as a movie location. (I think I have glimpsed it in Downfall and Valkerie.) Perhaps it will provide some exterior shots for the film version of Every Man Dies Alone, now in development; Emma Thompson and Mark Rylance have been linked to the project, so it appears to be in the sensitive hands it deserves. When that movie arrives at an art-house cinema near you, it will open another chapter in the remarkable story of the resuscitation of interest in Fallada’s novel, and indeed his entire oeuvre. Fascination with his cauldron of a life is also growing. [i] Hans Fallada was born Rudolf Ditzen in 1893, but by the time he launched his literary career, in the shadow of Germany’s defeat in the Great War, it was out of the question — at least for his father, a highly respected jurist — that any book would appear under his real name. Having recovered from his self-inflicted injuries, Fallada was relatively lucky in that he was sent not to prison but to a mental hospital. Years later, after another shooting incident (this time involving his first wife, who was uninjured), he would end up in the Nazi version of such an institution. While that could very well have been a death sentence, it ironically provided him with partial protection from both his own demons and the fiery destruction of Germany. Fallada was old enough to have fought in the First World War and young enough to have fought in the Second, but saw action in neither. Then again, he had enough trouble on his home front. Fallada fashioned the pseudonym his father demanded from two of Grimms’ fairy tales, though he entered so many dark woods — including alcoholism, morphine addiction, and imprisonment for theft — that we can say his life bore some resemblance to a fairy tale only if we remember the Gothic heart rather than the Disney conditioning of the genre. Writing was his life raft. Many Anglophones are fans of those wonderfully long German compound nouns, and, in discussing Every Man Dies Alone, biographer Jenny Williams presents us with a (perhaps literally) breathtaking example: Vergangenheitsbewältigung: “the process of coming to terms with the past.” This process was a constant in Fallada’s work, whether that past was political or personal, or both. Pinneberg had the feeling, despite the fact that he was about to become a wage-earner again, that he was much closer to these non-earners than to people who earned a great deal. He was one of them, any day he could find himself standing here among them, and there was nothing he could do about it. He had no protection. […] His innermost conviction was: they all want something from me, but not for me. It’s all the same to them whether I live or die. “He was one of millions” — it reads like an epitaph for the Common Man, one that would be even more applicable in the decade that followed, as the slump of the 1930s became the slaughter of the 1940s, and disturbingly current still. Little Man, What Now?, published on the eve of Hitler’s dictatorship, made Fallada a writer of international stature, but this prominence would shrink as the Nazis began to box him in, morally and artistically. Ironically, that marshy middle ground turned out to be fertile soil for the creation of Every Man Dies Alone: a villain would not have had the imaginative capacity that Fallada displays with his almost Dickensian range of characters, and a hero, in the atmosphere of “unceasing surveillance” the novel vividly dramatizes, would have ended up in one of the cells under Prinz-Albrecht-Strasse, where the gravel monument now stands, long before May, 1945. At the end of the war, Fallada experienced a brief personal renaissance, with a new relationship and new responsibilities. But he was soon struggling with addiction again, and his heart was packing up. In his early 50s, he was an old man. But he still had one more great novel in him, even though it would take an external prompt to get the story on paper. Johannes Becher, a kind of cultural commissar in the emerging East German state, gave Fallada the Gestapo files related to the case of an ordinary Berlin couple, the Hampels, who for two years had carried out a brave if futile campaign of dropping postcards with anti-Nazi slogans in the stairwells of office buildings. Fallada drafted the novel in a blaze of 24 days in late 1946; his gritty swan song was published shortly after his death in the new year. Lightly fictionalizing the Hampels, Fallada came up with Otto and Anna Quangel, a working-class man and wife who lose their only son, and their political complacency, in the course of Hitler’s most preening military achievement: the defeat of France in 1940. The long but absorbing novelistic chronicle of their resistance, ordeal, and death (the insistent shadow of Gestapo Headquarters makes the idea of a “plot spoiler” a moot point) has always had a following in Germany. In fact, seeing that I was reading Every Man Dies Alone, the passenger sitting beside me on a transatlantic flight, who turned out to be a German orchestra conductor, struck up a conversation. The book was important to people of his generation, he explained, the postwar generation that came of age in the 1960s. We all acted alone, we were caught alone, and every one of us will have to die alone. But that doesn’t mean that we are alone […] or that our deaths will be in vain. Nothing in this world is done in vain, and since we are fighting for justice against brutality, we are bound to prevail in the end. However, more than 60 years would go by before English speakers could read Reichhardt’s stirring words, spoken in such dire straits. In 2009, the intrepid Melville House brought out Michael Hofmann’s crystalline translation, and it became a surprise international bestseller. The book was especially a big hit in Britain, where Penguin Modern Classics cannily retitled it Alone in Berlin (following the French Seuldans Berlin), which, along with the isolated trench-coat-wearing figure on the cover, gave it a suitably noir-ish appeal. Look for the film to have that name. The figure of “that Führer” looms over the modest apartment building at 55 JablonskiStrasse, where the Quangels live. Number 55 is a microcosm of Nazi-poisoned German society. Besides the quiet Quangels, its residents include an alcoholic older Nazi, his sociopathic Hitler Youth son, a slimy police tout, a sidelined judge from the Weimar days, and a vulnerable old Jewish lady. The plot relies on a fair amount of coincidence to bring these and other characters together at critical junctures, but it’s a device informed by Fallada’s sense of imaginative inclusiveness: ideology divides; literature reunites. The early chapters of the book plunge the reader — especially the Anglophone reader — into the nasty particularities of German life under National Socialism: we learn about corrupt or corrupting institutions such as the Winter Relief Fund (a stealth tax), the Arbeitsfront(an ersatz trade union), and the Napola schools (hothouses for the enfantsterriblesof the regime). But what really electrifies the novel is the dropping of the first card. In political terms, the postcards — with their earnest, awkward anti-Nazi slogans — have virtually no effect. In literary terms, they are worthy of Kafka. The cards implicate everyone: not only those who write and distribute them, but also those who read them, and even those who investigate them. The cards mean nothing, and everything. Fallada never had to face the hectoring Judge Freisler[iv] in the perversely named People’s Court, but he did pour all his remaining imaginative energy into leading readers through the Quangels’ inevitable trial and punishment. He did not live to receive the praise for his final, redemptive effort from a moral authority like Primo Levi. However, it may have been a mercy that Fallada died before having to deal with the full-blown censorship of the Communist GDR. He endured the Gestapo years; at least he was spared the Stasi era. The East Germans converted Göring’s headquarters into the Haus der Ministerien. (Our guide that day in Berlin used the more Orwellian term the “ministry of ministries.”) Our group turned left out of the former Prinz-Albrecht-Strasse and onto Wilhelmstrasse. When we eventually reached the far end of the building, at the corner of LeipzigerStrasse, we were in for another surprise, for here the Germans have preserved a long muscular mural from the Communist period. On an artistic level, it’s about as humane as those soul-killing tractor stories Martin Amis mentioned. The blue-uniformed troop of Aryan women look like they’ve marched right in from a Nazi mural. That garish reminder of how quickly, for millions of Europeans in the 1940s, one form of totalitarianism was replaced by another left me downhearted, until I saw that where we were now standing was the Platz des Volksaufstandes von 1953, which commemorates the first uprising against Communist rule. It, of course, failed, but left a legacy for the demonstrations of 1989, which brought down the Wall. Sometimes resistance begins with a protest. Sometimes with a postcard. [i] As well as publishing four of Fallada’s novels (including Little Man, What Now? ), Melville House have also issued Jenny Williams’s biography More Lives than One, originally published in Britain in 1998. [iv] CalledFeisler in the novel. If you have seen Marc Rothemund’s powerful 2005 film Sophie Scholl: The Final Days, then Roland Freisler is a chillingly familiar figure. Robert Cremins is the author of the novels A Sort of Homecoming and Send in the Devils.